10. The first row is bonnet stitch with twisted chain stitch, the second row, is with cable chain. 11.in the first row, Palestrina knot stitch is worked with bonnet stitch, and a variation of buttonhole stitch is worked with bonnet stitch in the next row. 12.Bonnet stitch with crossed buttonhole stitch in the first row, and closed buttonhole and bonnet stitch in the second row. 13. Cretan stitch, bonnet combination is the first row, feather stitch with bonnet stitch in the second row. 14. the first row, a variation of feather stitch is worked with bonnet stitch , the second row, after whipping the bonnet stitch, pearl beads are added . the third row, bugle beads are added in between bonnet stitch. I never realized when I started learning this stitch ,it will lend itself to so many variations. The other challenge participants have done great work, especially the way some have used this stitch to fill spaces, working this stitch to form a flower. Very impressive indeed. SharonB has to be thanked for this wonderful experience. Today I practiced on this stitch some more. The stitches are much better now. 5. In the first row, two rows of bonnet stitch are worked facing each other. 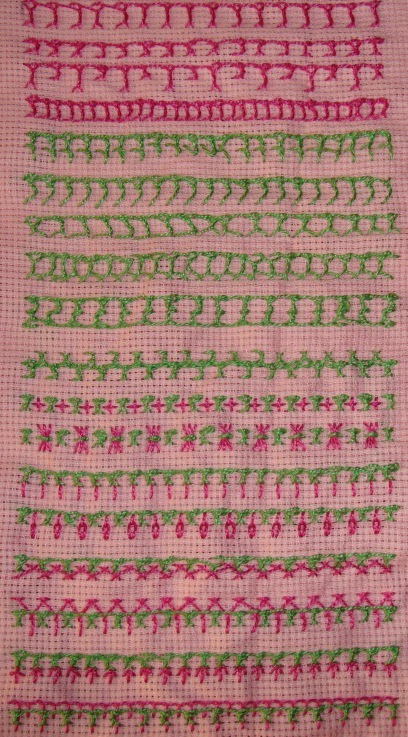 The second row, the up and down version of bonnet stitch. 6. 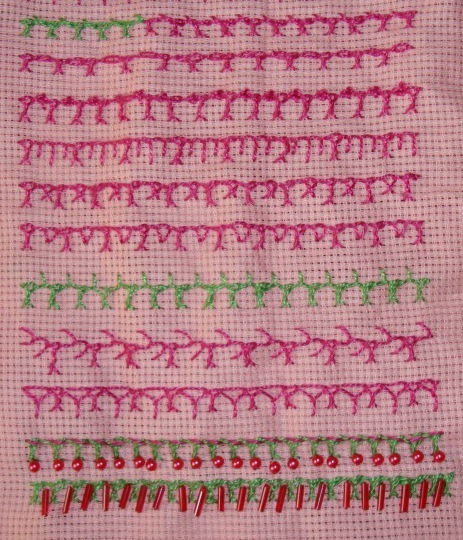 Individual bonnet stitches are worked with upright cross stitches in the first row, butterfly chain stitch in the second row. 7. Bonnet stitch is worked over straight stitches in the first row, detached chain stitches are worked in between bonnet stitch in the second row. 8. Bonnet stitch with herringbone in the first row, and with half chevron stitch in the second row. 9. Fly stitches are worked over bonnet stitches in the first row, bonnet stitch is worked over a line of buttonhole stitch variation in the second row. Combining bonnet stitch with some other stitches is the next goal. This week’s stitch on the TAST challenge by SharonB is bonnet stitch. I am working this stitch for the first time. Though this was part of the previous TAST challenge, I did not attempt it then. The stitch looked simple enough, Sharon had made a suggestion of using perle cotton instead of cotton skeins, with her boosting, I started with perle cotton. It does work well. This stitch has both twist and flip , with that combination, it was tricky to control the working thread, which I learnt after working a few rows! Each and every stitch had a mind of its own, which I thought was my inability to work this stitch. Later understood that, the working thread had to be held and cajoled to work the way we want. 1. I wanted learn this stitch in the first row, the stitches are long on this row, the next row, the stitches are shorter. 2. In this row, the long and short stitches are worked alternatively. The next row,the stitches are worked as closed version, looks like open chain stitch gone wrong! 3. In the first row, the stitches are slanted on one direction. The second row, the stitches are slanted the other way. 4.in the first row ,the stitches are worked with wider width. Of course unsuccessfully! The next row, the needle was inserted in the space of the previous stitch.